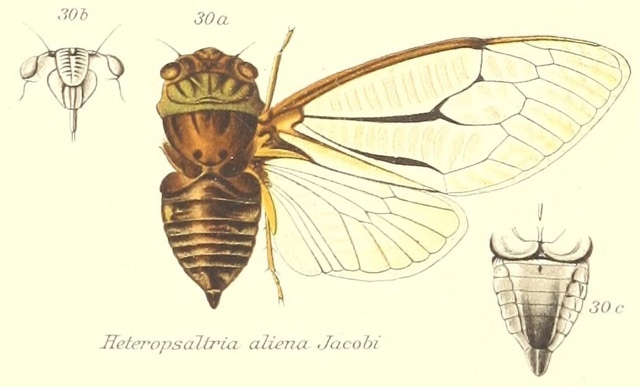 Heteropsaltria aliena Jacobi, 1902, is a cicada found in the Solomon Islands. Characters. — Head about as long as breath between eyes, a little shorter than pronotum, including eyes slightly broader than anterior margin of pronotum ; ocelli distinctly more remote from eyes than from each other; face longer than broad, moderately prominent; pronotum shorter than mesonotum including the basal cruciform elevation, the lateral margins distinctly broadly angulate near base; abdomen shorter than space between apex of head and base of cruciform elevation; tympana concealed; opercula short, transverse, not passing base of abdomen; rostrum passing the intermediate coxae ; tegmina broad, but not more than twice as long as broad, basal cell longer than broad, radial area large and broad, considerably longer than half the whole length of tegmen, thus causing the shortening of the three upper ulner areas; apical areas eight; wings narrower but more than half the length of tegmina, apical areas six.